Pasta is one of those standbys that is perfect for meals in a hurry. I often make tomato sauce to go with pasta and add carrots and onions and any other vegetables I happen to have around – parsnips work well. The other day, I was in even more of a hurry than usual and so I thought I’d try blending a raw tomato sauce instead. I was a little surprised at just how good this quick tomato sauce with seaweed was. In went the usual suspects, a large carrot, garlic, herbs from the garden and a tin of tomatoes. I didn’t add an onion as I thought that would be a bit much, but I did add a little seaweed. Seaweed is full of all sorts of nutrients and I often add it to soups and stews, but never to a raw sauce before. My favourite variety is dulse, a purple seaweed which is quite tender and mildly flavoured. Living near the Cornish coast, means we are able to collect our own. My high speed Froothie Optimum 9200 blender is a powerful beast indeed and made short work of blending the ingredients to an ultra smooth sauce, including the carrot and seaweed. You might like to read my Optimum 9200A high speed blender review to find out more. 6 August 2018 update. Since writing this post Froothie now have a splendid vacuum blender. This means I can now make this quick tomato sauce with seaweed and heat it at the same time in the blender. Yes, you heard right. The blender doesn’t have a heating element, but heats by friction. 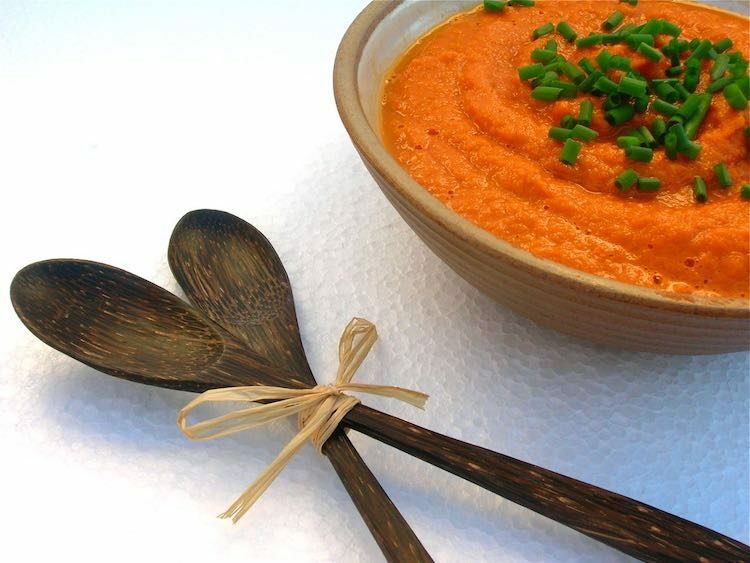 Blend for six minutes and not only is the sauce silky smooth, but it’s hotter than you can eat too. Read my review to find out more about this fabulous Optimum Vac 2 Air Vacuum Blender. Mixed into hot pasta with a bit of grated cheese on top, this quick tomato sauce with seaweed made for a speedy and tasty meal. The sauce took less than 5 minutes to make from start to finish. I’m waiting for the tomato season now, because as good as this sauce was, how much better would it be with fresh ripe tomatoes? A super speedy no-cook tomato sauce for hot pasta made in a blender. Added carrots and seaweed give extra flavour as well as nutrients and there's chilli for a bit of heat. 1 large organic carrot - scrubbed but not peeled and roughly chopped. Throw all ingredients into a high speed blender and blitz on fast for about 30 seconds (I put mine on the 35 second cycle, whilst grating cheese for the pasta). nb if you have a soup facility you can blend for 6 mins or so until piping hot. Stir into hot pasta and top with cheese if desired. Can also be easily heated in a pan if desired. With the lovely spring herbs of thyme and chives in this recipe, I’m sending my quick tomato sauce with seaweed off to Karen of Lavender and Lovage for Cooking with Herbs. With the carrot slipped into the sauce, I reckon it qualifies for #ExtraVeg which is being hosted at Jo’s Kitchen this month on behalf of Fuss Free Flavours and Utterly Scrummy Food for Families. Family Foodies is all about Italian food this month and as tomato sauce to eat with pasta is about as Italian as it gets, even if they might not recognise this particular one, I’m crossing fingers and hope it will be accepted over at Bangers & Mash and Eat Your Veg. This also goes to Jac’s brand new blogging event Meat Free Mondays over at Tinned Tomatoes. 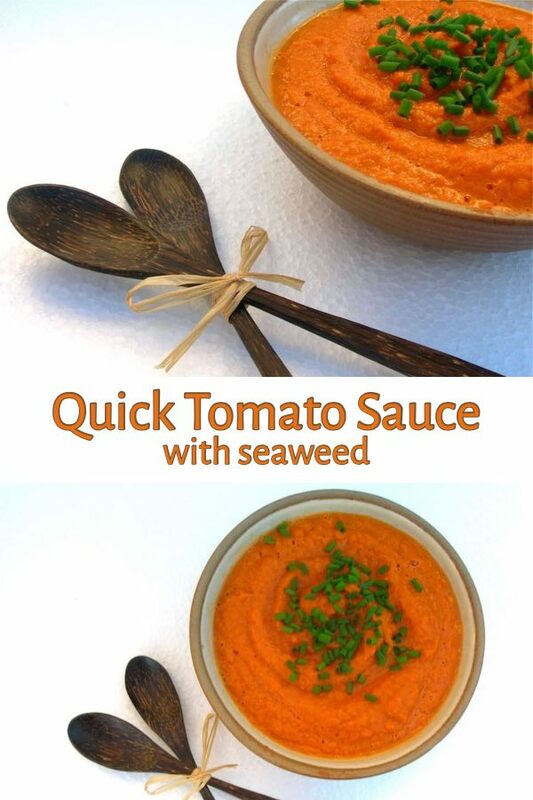 Quick Tomato Sauce with Seaweed. PIN IT. This post contains affiliate links to Froothie Optimum products. Buying through a link will not cost you any more, but I will get a small commission. Thanks to my readers for supporting the brands and organisations that help to keep Tin and Thyme blythe and blogging. Yes please, I LOVE the look of this and have been looking for something new to toss through my courgette and mooli noodles tomorrow. Fantastic ! I hope you like it Anita-Clare. Let me know what you think. YES please too – LOVE anything seaweed and what a great recipe to use in your froothie machine! Ah yes Karen, the wonderful froothie. I wonder how I managed without it. Seaweed is a much underused resource and I have to confess, I tend to put it on our vegetables beds rather than in our soups! I need to remember to use it more. My OH makes a lovely raw tomato sauce in the summer and I really love it. I will ask him about adding in seaweed next. You have a remarkable OH Bintu. 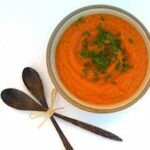 I have a fantastic raw tomato sauce recipe too, given to me by my Italian sister-in-law. This was the first time I’ve ever used tinned tomatoes in such a way. That sounds really good, you are making some lovely recipes in your froothie. Thanks Janice, it’s a rather splendid machine that is just begging to be used. Haha Johanna. Rustic is the word, mostly we are down on the beach with our wellies heaving seaweed into sacks to take back for our vegetable beds. But when I see a nice piece of dulce I save it and treat it a bit differently 😉 I used seaweed quite a bit in soups and stews, but was rather pleased with the inspiration to use it in this sauce. I like your tomato sauce and I the idea of adding seaweed is really good! A nice twist to the recipe. And the fact that it is so quick to make is a real bonus. I like your new site. Great job! Is it a sin wanting to drink the whole bowl of sauce off? It looks very delicious! Definitely not a sin Angie, but it’s quite strong, so you would probably want to dilute it with something. Definitely worth a go Sarah, Seaweed is meant to be quite good for us. Thanks Stephanie. It’s always useful I find to have something that can be made in a trice. Thanks Helen. I’m not very adventurous with seaweed, though I do use it in soups, stews and curries a lot. What a lovely tomato sauce, I really like the twist on adding the sea weed, apart from the fried variety in Chinese restaurants I have never tried it. Seaweed is packed full of nutrients Nayna, so it’s a useful addition to have. Generally the stuff you get in Chinese restaurants is cabbage not seaweed. What a fab easy recipe, just one question, do you really blitz it for 30 minutes? Eek, thanks for pointing that out Camilla, I have just corrected it.